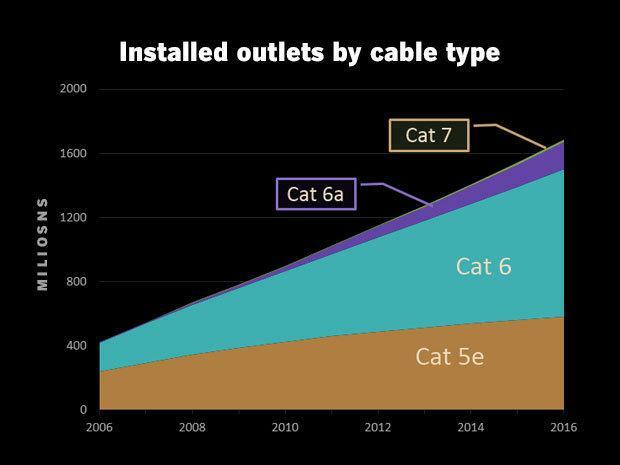 As expected the IEEE has ratified a new Ethernet specification -- IEEE P802.3bz – that defines 2.5GBASE-T and 5GBASE-T, boosting the current top speed of traditional Ethernet five-times without requiring the tearing out of current cabling. The Ethernet Alliance wrote that the IEEE 802.3bz Standard for Ethernet Amendment sets Media Access Control Parameters, Physical Layers and Management Parameters for 2.5G and 5Gbps Operation lets access layer bandwidth evolve incrementally beyond 1Gbps, it will help address emerging needs in a variety of settings and applications, including enterprise, wireless networks. Indeed, the wireless component may be the most significant implication of the standard as 2.5G and 5G Ethernet will allow connectivity to 802.11ac Wave 2 Access Points, considered by many to be the real driving force behind bringing up the speed of traditional NBase-T products. “The applications for NBASE-T solutions are vast and growing. Enterprise, small medium business, industrial and home networks can take advantage of this technology to enable higher capacity wireless access points and faster downloads to client systems such as medical imaging systems that work with large data files, upgraded industrial and home networks,” the NBASE-T Alliance wrote of the ratification. "Last quarter, NBASE-T switch and access point ports surged significantly as enterprises began to upgrade their campus networks to speeds beyond 1G," said Alan Weckel, vice president of Ethernet switch market research at Dell'Oro Group in a statement. "There will be a sizable upgrade cycle around NBASE-T technology with robust growth expected over the next several years. As a result, we expect 2017 NBASE-T port shipments to exceed three million ports." Hand-in-hand with adoption of a low-speed Ethernet standard by the IEEE, proponents of the technology will hold an interoperability plugfest in October to tout the readiness of 2.5GBASE-T and 5GBASE-T products. For the plugfest, which will be held the week of Oct. 10 at the University of New Hampshire InterOperability Laboratory in Durham, N.H., the two groups behind the new Ethernet speeds the Ethernet Alliance and the NBASE-T Alliance will work together and share post-event results of the interoperability testing performed.